Many things capture the essence of classic Americana, but few do it on such a scale like the Levi’s blue jeans and chino pants did. There is even a song about it – and it has Oreo cookies. In a country with strong ties between the people and the military, it is no coincidence then that Chinos originated from the army. 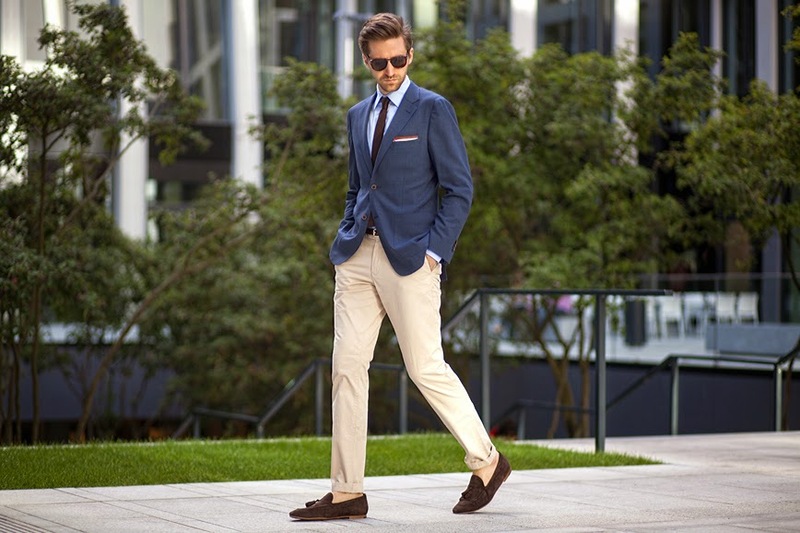 Chinos are undoubtedly one of the most versatile pieces of the modern man’s wardrobe. Since their inception they have taken many forms and are commonly (and mistakenly) referred to as khakis. It is equally as important to have them in your closet, as it is to understand their history and different types. Sitting exactly in the middle of the formality scale makes them the ideal pair of pants to dress up or down. In today’s article, we will discuss “How To Wear Chinos” and the rich history behind them. 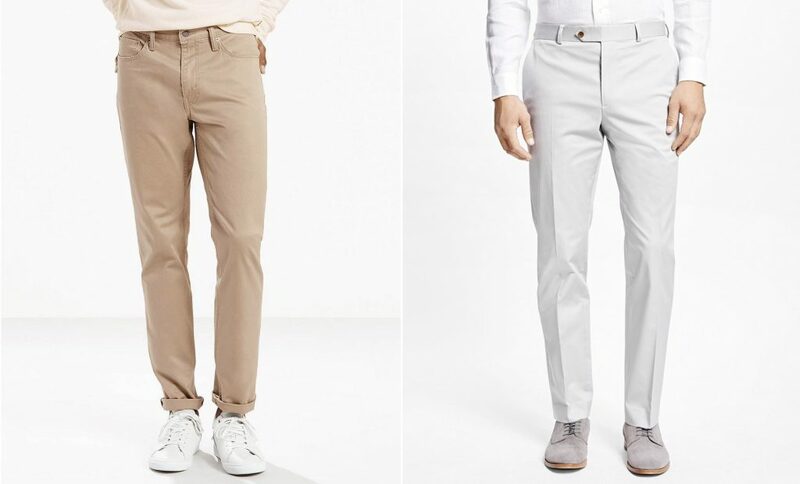 What Is The Difference Between Khakis And Chinos? Before we continue, we must answer one of the most common questions. Are khakis and chinos the same thing? Lucky for you, we have a very simple explanation. Chinos are pants that are made from cotton using the twill weave. In fact, the correct way to call them is Chino, but we will explain that soon. These pants can be of any colour that you can imagine, including khaki which is a shade of light brown/tan. If you want a nice trick to distinguish between Chinos and Khaki-style pants though, look at the stitching. Chinos have concealed stitching as opposed to Khakis, making them more formal. Simply put, khakis are chinos with a certain colour, but chinos do not have to always be khaki-coloured. 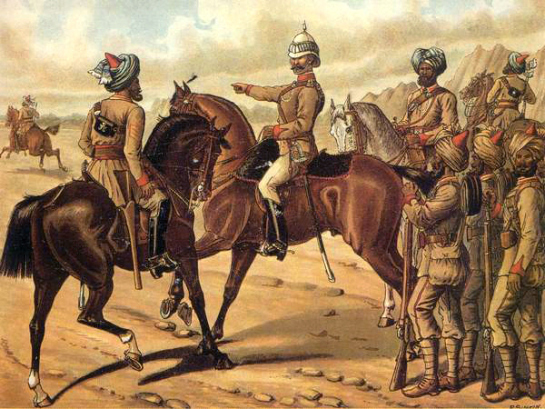 In order to pinpoint the origin of Chinos we must travel back in India of 1848. Sir Harry Lumsden who was a commander of the Corps of Guides (a British-Indian Army) attempted to camouflage his uniform using a mixture of coffee, curry and mullberries. He created a dye which became known as khaki, the Indian word for “dust/soil“. Their influence expanded and their comfortable nature made them very popular and eventually adopted by the Indian forces. It was until 1898 though when the word “Chino” was coined by the Americans. 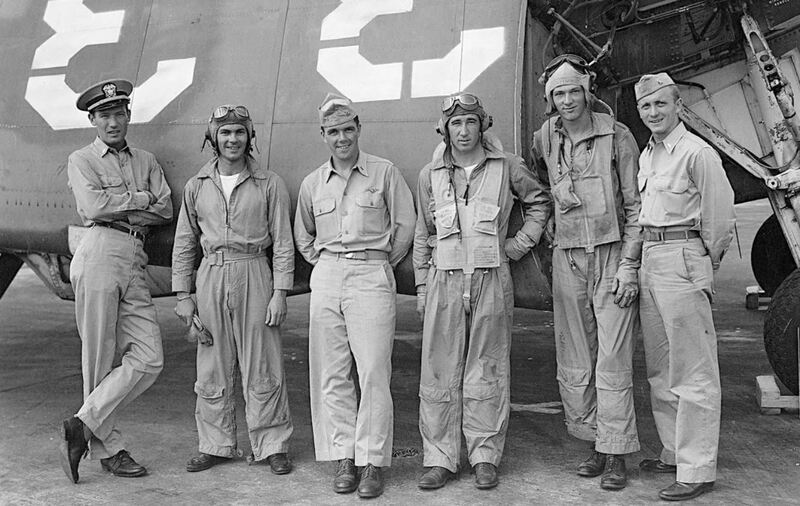 The American soldiers stationed in the Philippines started using khaki pants based on the ones the British used in India right after the Spanish American War. They were very comfortable, made out of cotton twill and provided camouflage. It then became a staple in the US military. “Chino” is the spanish word for China, which is the origin of these pants. After World War II, Chinos became extremely popular and a symbol of the effortlessly cool, hard-working American. Since it’s inception, it has taken many forms and spread all over the world, becoming a staple in every man’s wardrobe. I have a special connection to the word “Khaki”. 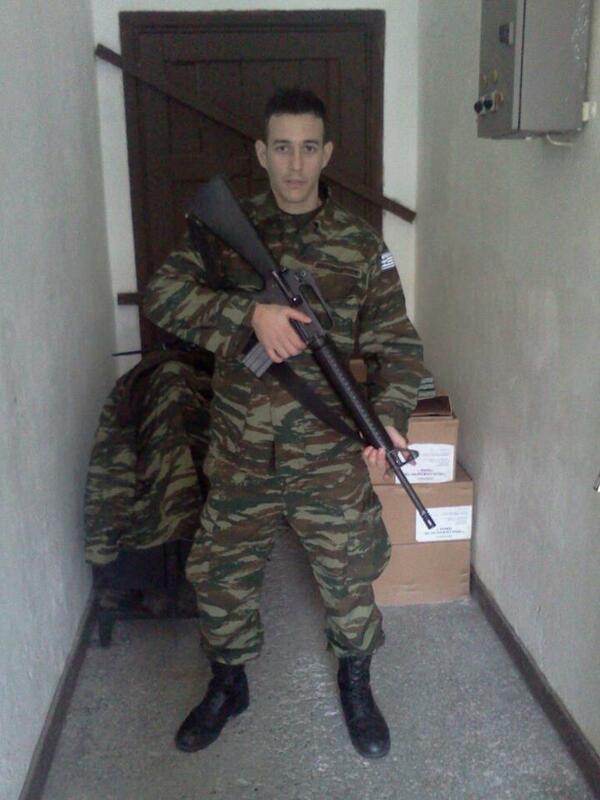 In Greece military service is still mandatory and when you put on the uniform you are wearing the khakis. These khakis though are not the traditional chinos mentioned above. What Greeks consider Khaki – Yes that’s me 6 years ago! I was in the helicopter division of the Greek Special Forces. Greek soldiers wear a shade of dark green which is quite similar to the one green berets use. In our language, this is what we call khaki. Are Chinos Formal Wear Or Casual? Chinos sit in the middle of the formality scale. In 2018 dress codes are very different and casual looks are taking over. This means that Chinos are more than acceptable in most workplaces these days. 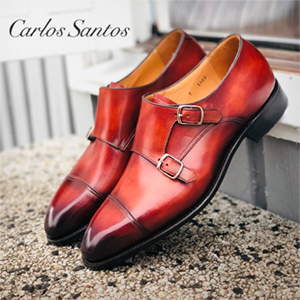 You can wear them with suit separates and create a great business casual look, or you can wear them with sneakers and a denim shirt for a more relaxed, casual outfit. Their versatility is what makes them so indispensable. Casual Chinos:These resemble a lot your regular jeans. They have patch back pockets, standard side pockets and a more rugged texture. Formal Chinos: These on the other hand look much more than wool dress pants. They have jetted back pockets with buttons, optional pleats, belt loops, more subtle front pockets and tab closure. Small stylistic differences which you can use to your advantage when creating your outfit. Choosing between 100% cotton and stretch Chinos is a matter of preference and if you cannot decide between them you can always opt for a blend. Now that we have discussed the history and the basics, it is time to put emphasis on the most important aspect. Fit. I am a strong advocate that all your clothes should fit properly since the first ever article of Misiu Academy. Chinos these days have a typical mid-rise waist and a slim fit which can flatter your body quite a bit. 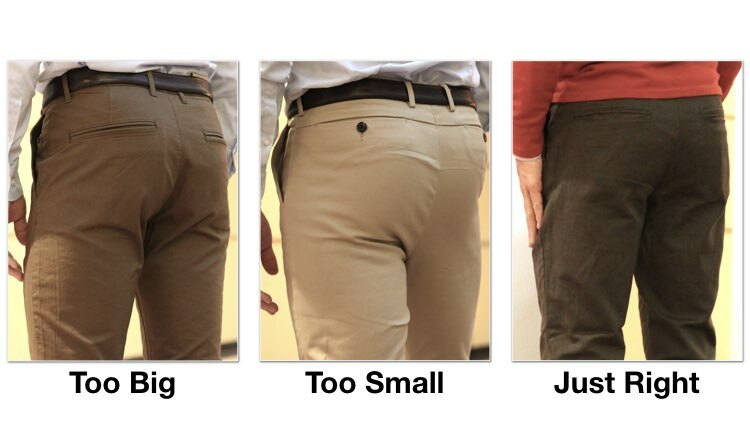 Please try to avoid some of these ultra-tight, skinny Chinos. Your pants should be slim enough to compliment your body but loose enough to move around comfortably. You should try to have a clean break which means hemming your pants to the tailor. It is the cheapest and easiest alteration that you will ever do. Make sure that the pants are not baggy in back or very tight in the crotch as it looks bad and draws unnecessary attention. I would avoid cutting them short, as I personally consider this style ridiculous and unattractive. 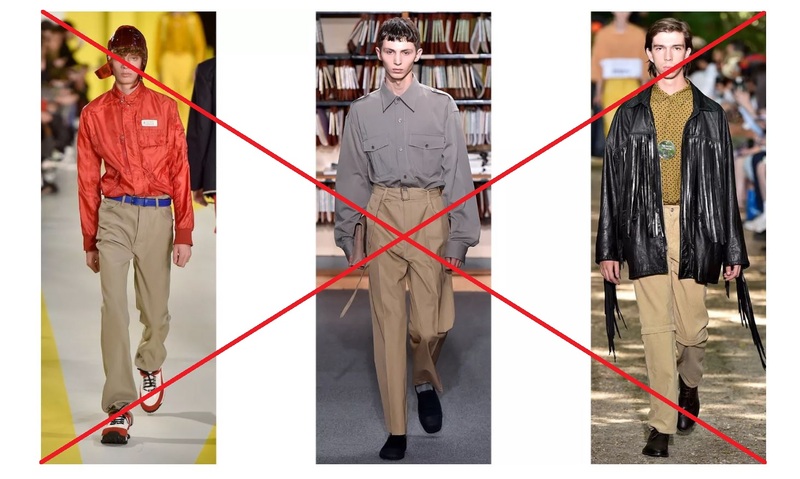 I read an article where they said that wide leg so-called Chinos with a high rise and low cut are perfect for the fashion conscious man. It is like saying that Donald Trump is not a misogynist. When it comes to pleats…I would say they are a relic of the past and generally not a fashion for the younger man. 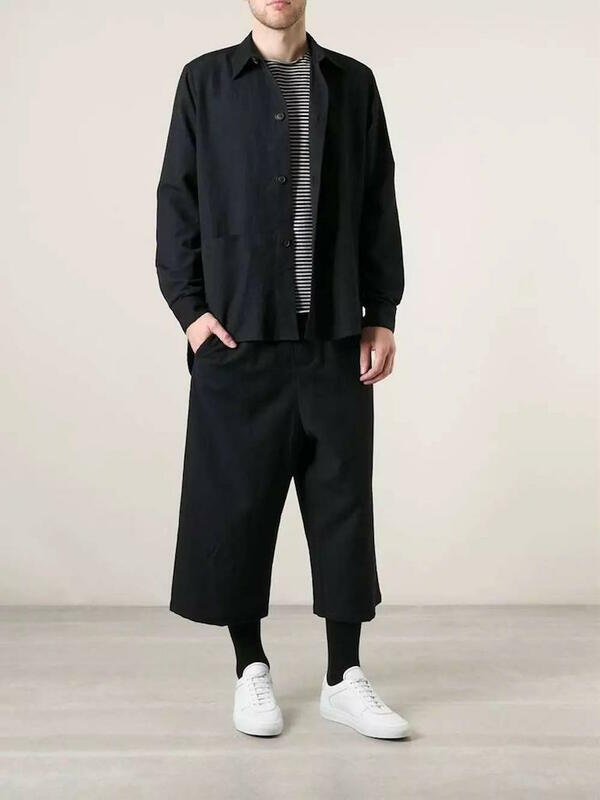 You can see that single and double pleated pants are making some sort of comeback, but I find them very loose and unflattering. Experiment with colours instead. Got It, What About Colours? In 2018 any colour combination is possible. Instead of going amok though and splurging your hard earned cash on bad options, start with the basics. Misiu Academy always recommends you to build a minimalist interchangeable wardrobe and Chinos are no strangers to that. Shades of navy blue, olive green, tan and khaki are very versatile and can create many combinations. Pastel colours are more of a summer options and not great for winter climates. Additionally, pastel colours do not belong in the board-room. Unless you are the boss. If I had to choose, I would buy 3 Chinos to begin with. One in the classic khaki colour as a more formal option, one navy blue cotton-stretch mix and one olive green stretch chino. That way, you are well prepared for business casual, smart casual and casual occasions. Before we begin with the various occasions, it is worth noting that you should buy quality and nothing made of synthetic materials. However, I would not spend a fortune on Chinos, since less than 100$ can buy you a really good pair. Business Casual has infiltrated the corporate world and there are less and less strict dress codes these days. 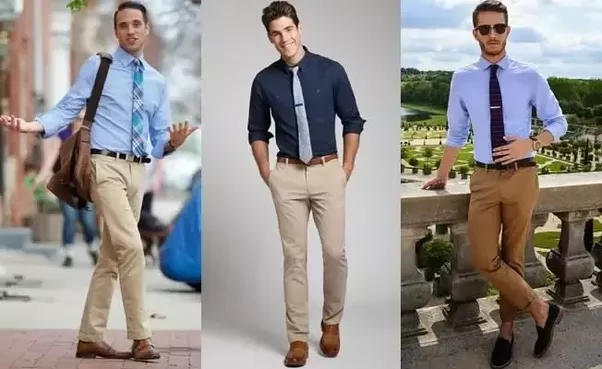 If your office does not have a white collar dress code then you can create a very good, professional and effortless look using dressier Chinos. In essence, you do the same thing as using suit separates but instead of wool pants you use Chinos. Think for a second what makes a look feel like business? Using these elements you can easily create an outfit. Only this time, you should choose your pants first. Khakis, beige and tan formal Chinos are perfect for this. Very versatile and compliment wonderfully colours like navy. Your shirt is an easy choice. White goes well with everything, but this is your chance to explore the colour palette. Going back to our Shirt Guide, you should have at least a blue and light pink shirt in your closet. A shade of light blue makes perfect contrast with your khaki Chinos. Try a subtle pattern with stripes or checks or even a plain solid one. A navy blazer is the possibly one of the best combinations with shades of brown and compliments lighter blue shirts like nothing else does. This is exactly why we promoted a blue suit as your first suit. It is one of this look’s elements that will keep it professional. Choosing a tie is more of a personal choice. One of my favourite colours is brown while the other one is dark green. Both go very well with blue and khaki. Pattern wise I really like dots which have a touch of playfulness or solid colours in silk. Silly patterns and animal prints do not belong in the board room. When it comes to shoes a man has quite some options. My personal favourites are Oxfords, Chelsea Boots and recently, Monk Straps. They are dressier versions and help me look a cut above the rest. Another option are brogues and derbies and in some cultures loafers are appropriate. If you are younger like most of Misiu Academy’s readers, you will want to look more mature and older, so your shoes are a chance to show this. In other words, I would not use loafers. There is only one thing left to complete your outfit and that is suit accessories. Do not leave the house without your watch, clean underwear, socks and of course your signature scent. I have been using the D&G The One EdP and it has been fantastic. A tie clip can add some extra flair to your look. Pro Tip: Make sure you are always clean, well-groomed, smell nice and you iron your shirt. When you look good, you feel good. Dressing down to Smart Casual is quite easy. You lose the tie, unbutton the collar and in principal you are ready to go. 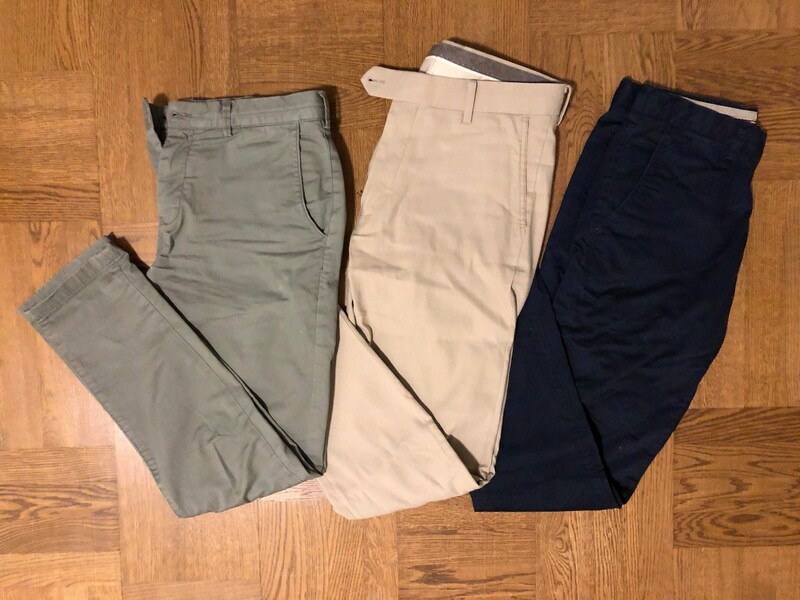 Let’s create a few outfits based on our 3 Chinos. While you can just lose the tie from the previous outfit and make it look more casual, we can do better. This time, you can pair your khakis with a denim shirt, which gives it some texture and finesse. You can choose to keep the navy blazer or you can change to a navy bomber jacket for a more street look. My favourite part of this kind of look is the shoes, where you can downgrade to sneakers and still look classy. I personally use brown suede sneakers by Carlos Santos. Winter is here and we love it. Why? Because we love every opportunity to layer. Pair them with a white dotted shirt and a grey merino wool sweater or a light pink cashmere sweater. We top them off with the a navy bomber or quilted jacket. Dress it up with some Chelsea Boots or down with a pair of white sneakers or chukkas. 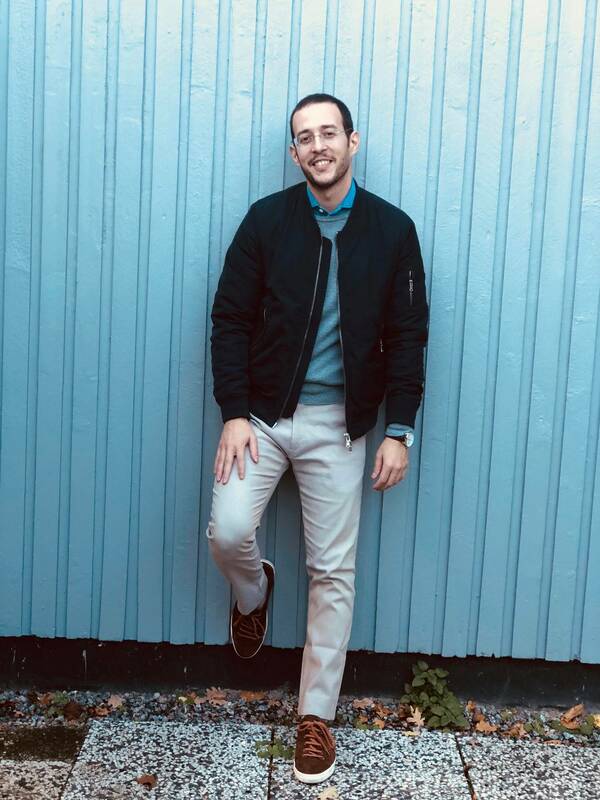 Loafers work pretty well as well, however they are a little hard to use in Sweden with colder weather. One of my preferred go to looks on a casual day is the olive green Chinos. Comfortable and well-cut, it is very easy to slip into and wear for prolonged periods of time. If the weather allows, wear it with a T-Shirt or a Polo Shirt. Colours are quite flexible, but shades of blue, brown and grey work really well together. It might also be the perfect time to take your denim jacket out for a spin. The bottom line is that all these three combinations are interchangeable. Think of the possibilities, you can have looks for a whole month just by changing a piece every time. But Where Do I Buy Them From? Now that you know how to wear Chinos, you need to think where to buy them from. There is no real answer to this question, you should find a shop you trust and can feel the fabric. Most importantly, a physical store where you can wear the pants and understand how they fit. I personally have bought all of mine from Brothers, which is a Swedish only store but offers very good deals if you happen to be here. Suitsupply has some nice offerings but they seem to have brought back pleats and some Chinos that resemble sweatpants. I am not very fond of those and hopefully this trend will disappear soon. J.Crew for the ones in the US, Polo Ralph Lauren and Brook Brothers if you have more cash to burn are all viable options. Lastly, there is a brand called Cordings that offers pants in many unusual colours but most of them do not belong in the office and should not be your first pick. Build your minimalist wardrobe first. Announcement: This post contains paid advertisement through a link for Brothers Sverige. Before we conclude I feel I need to share something with you. Please, do not fall for those horrible trends that are out there. You will not be cool, nor you will look good. My mother used to buy me some horrible shirts when I was a little kid. I loathed them. “It’s in fashion, it is D&G!” she said, trying to convince me as much she wanted to convince her. Stick with the classics, experiment with colours and a few accessories and instead of looking like a clown, everybody will remember you as the man that always dresses sharp. Hurry Up With The Conclusion Already! Chinos should be a staple in the younger gentleman’s wardrobe. They are pants with distinguished military heritage and versatility like no other. Made from lighter or heavier cotton, Chinos can be worn on all seasons of the year without looking out of place. Not only that, they can dress up or dress down an outfit accordingly while at the same time freshening up your look. Start with more traditional colours like khaki and navy and you will be surprised how comfortable they are or how often you they will be first choice. Stick to a nice slim cut and I better not see you outside with those wide, high-water Chinos. Or an ascot. Please do not wear ascots unless you are an artist or a 63 year old wine tester. That being said, we have concluded our article on “How To Wear Chinos“, entering Misiu Academy’s 5th month of existence! Share your joy in the comments down below and let us know if we missed something. Share your story and we will see you on the next one!